BLAST, an initiative that gives students tablet computers to use in school and at home, was implemented sometime in the 2012/2013 school year. Planning for the school began in 1970 when City Council agreed to spend $7.2 million. When a site was identified at McIntire Park, it was soon learned that the deeds of the land restricted its usage to "white people as a park and playground." The site had to be moved outside of park limits. Construction of the school was delayed and the fall semester had to be moved up to September 16, 1974. ↑ Web. About Charlottesville High School, City of Charlottesville, retrieved June 6, 2011. ↑ Web. Staff Directory, retrieved 1 June 2012. ↑ 3.0 3.1 Web. 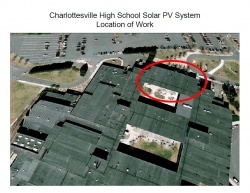 Charlottesville High: Extraordinary Students, Extraordinary School, retrieved 1 June 2012. ↑ Web. Charlottesville High adds urban farming entrepreneurship class, Aaron Richardson, Charlottesville Tomorrow, December 1, 2016, retrieved December 13, 2016. ↑ Web. Dahl becomes 4th CHS principal to quit in 8 years, Aaron Richardson, Charlottesville Tomorrow, April 14, 2016, retrieved April 15, 2016. ↑ Web. Jill Dahl, Charlottesville City Schools, Charlottesville Tomorrow, November 9, 2013, retrieved November 12, 2013. ↑ Web. New leadership coming to Charlottesville, Western Albemarle High schools, Aaron Richardson, Daily Progress, World Media Enterprises, May 5, 2013, retrieved May 6, 2013. ↑ Web. Irizarry named as new CHS principal, Aaron Richardson, Charlottesville Tomorrow, May 25, 2016, retrieved December 13, 2016. ↑ Print: The Seventies: Central Virginia Ends Decade of Joy and Tragedy, Doug Kamholz, Daily Progress, Worrell Newspaper group January 1, 1980, Page . ↑ Web. June 2012 Construction Report, Department of Public Works, City of Charlottesville, retrieved June 28, 2012. ↑ 11.0 11.1 Web. , retrieved June 6, 2011. ↑ Web. Curry School professor tackles academics with CHS athletes, Tim Shea, Charlottesville Tomorrow, retrieved June 25, 2013. This page was last edited on 6 February 2018, at 15:01.